By the great achievement of Emerging Materials Congress 2019, we take immense pleasure and privilege to announce and welcome you to join, submit your proposals for the “18th International Conference on Emerging Materials and Nanotechnology” (Emerging Materials Congress 2020) with exciting theme "Modern breakthroughs in the field of Materials Science and Nanotechnology" which is going to be held in London, UK during February 26-27, 2020. 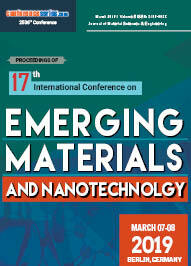 Emerging Materials Conferences 2020 is a unique event and platform for global scientists, researchers, directors, professors, engineers from the research areas of Materials Science, Nanotechnology, Chemistry and Physics to share their knowledge and research experiences with interactive panel discussion and sessions by Keynote Lectures, Oral Presentations, and Poster Presentation. 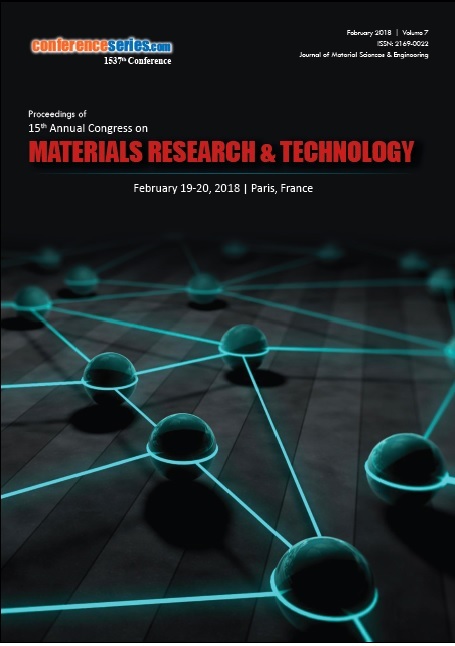 The scientific sessions will comprise research areas of Advanced Materials, Polymer Science, Materials Science, Nanotechnology, Tissue Engineering, Carbon Materials, Energy Materials, Biopolymers, 3D Printing, Ceramics, Conductive Materials, Electrical, Optical and Magnetic Materials, Materials Applications, etc. Submission of proposals for Oral presentations and Poster presentations are invited. The Conference will also provide space for companies and/or institutions to present their services, products, inventions and researches. Emerging Materials Congress 2020 provides best opportunity for delegates from various Institutes and Universities to interact with superlative scientists and Materials experts worldwide. This conference acts as a dais in linking Academicians and Industries to transform the innovative research works into products. The sphere of Materials Science is the interdisciplinary field connecting chemistry and physics which concentrates on the properties of a material and their microstructure. The advancement in Materials Science leads to the designing of novel materials and provides acquittance for engineering applications. Materials are dynamic for the industrial and social-economic development of the society. 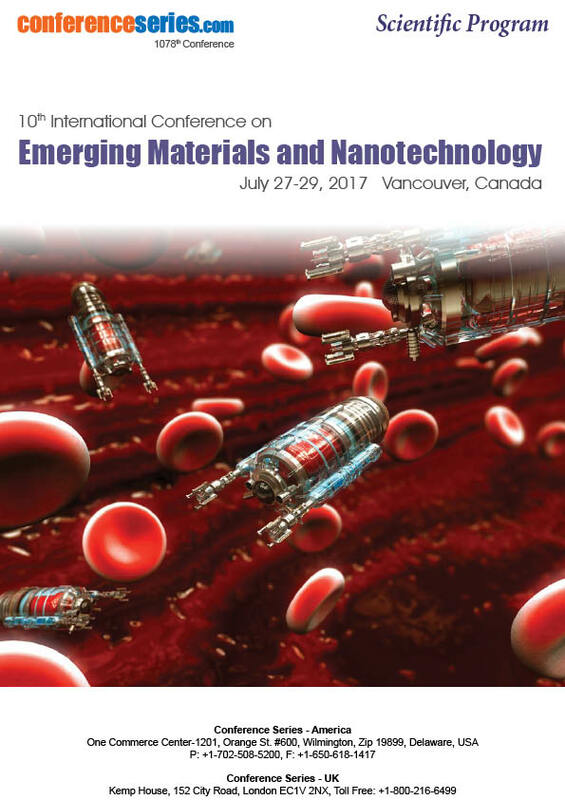 The emerging materials and its remarkable technology in the new era expose exciting advances in micro and Nano-engineering. The preceding importance of the material science is to recognize the required material, or a combination of materials based on its cost and performance for intended use of a specific product. The insight of material science domain involves the behavior of materials and the variability in their properties by understanding the quantum mechanics at the sub-atomic or atomic measure. Material science is also an important part of forensic engineering and failure analysis of materials, products, structures or component. This zone of study focusses on the processing of new materials which facilitates its applications to the next generation of engineers and its high marketability has a great impact on the economy of the country. In the new decade, the sustainability and influence on the environment lie in the core of the materials development. 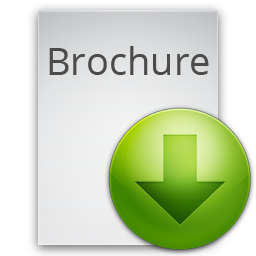 Emerging Materials Congress-2020 covers the areas of Material Science and Engineering, Advanced Materials, Biomaterials, Materials Chemistry, Energy Materials, Polymer Technology, Nanotechnology. Nanotechnology tailor the structure of materials to smaller scales in the range of 1 to 100 nanometers to attain precise properties so that the materials performance is improved. Average commercial products on the market depends on nanoscale materials and has its application in Electronics, Information technology, Medical, Healthcare, Environmental remediation and future transportation. Emerging Materials Congress 2020 affords outstanding opportunity to meet and make new contacts that associates you with delegates in the field of Nanotechnology, Materials Science and Engineering, by providing break-out space with tea and lunch for delegates between sessions with helpful networking time to uncover new ideas. The important subjects are lectured by the globally recognized key note speakers thus discussing on the emerging technologies and advancements in the sphere of Materials Science and Nanotechnology. Nanotechnology is well-defined as the handling of matter on an atomic, molecular, and supramolecular scale. Earlier, Nanotechnology was defined as the area of employing atoms and molecules to produce nanoscale products, which is also referred to as molecular nanotechnology. The National Nanotechnology Initiative has defined nanotechnology as the management of material with the measurement of 1 to 100 nm. Nanomaterials are physical materials with a characteristic measurement between 1-150nm that are the building blocks of applied nanotechnology. Nanomaterials have led to the production of several materials with the help of Interface and colloid science such as carbon nanotubes, fullerene, nanorod, and nanoparticles as well as the properties of nanomaterials differ from those of bulk materials because of their exceptional optical, electronic and mechanical properties. Engineered nanomaterials (ENMs) are produced with novel physico-chemical properties for a precise application of minerals and other chemical substance. Nanomaterial exploration is a material science-based method that has its application in optics, catalysis, healthcare, electronics, cosmetics, pharmaceutics, and energy conservation. As the global demand for energy is increasing on a higher frequency, materials are the key aspects of new technologies for renewable energy sources, supercapacitors, energy storage in batteries, thermoelectric devices, energy conversion through solar cells and fuel cells. The dynamic research areas comprise clean energy conversion, biofuels, hydrogen generation and fuel cells. Materials for energy can help to produce efficient sources of energy to meet the present concerns and is a key driver for our society. Materials with emerging energy technologies are the supportable energy foundations to withstand the geophysical alteration. Solar energy is superior and the development of photovoltaic cells is needed for the existing development. The piezoelectric, ferroelectric materials and thin films are the valuable materials for the conversion of energy. The study of the physical and chemical process that rises by incorporation of two phases, with solid-liquid/ solid–gas/ solid–vacuum/ liquid-gas interfaces is named as Surface Science. The actual application of surface science in related areas like chemistry, mechanical engineering, electrical engineering, and physics is recognized as Surface Engineering. Surface Chemistry achieves the alteration of a chemical configuration of a surface by presenting functional groups and additional elements while Surface physics deals with the physical deviations that arise at interfaces. Techniques tangled in Surface engineering are spectroscopy methods such as X-ray photoelectron spectroscopy, low-energy electron diffraction, electron energy loss spectroscopy, Auger electron spectroscopy, Thermal desorption spectroscopy, ion scattering spectroscopy and secondary ion mass spectrometry, etc. The chemical reactions at the interface are generally termed as Surface Chemistry and are also linked to surface engineering. The significant areas of Surface Science and Engineering is heterogeneous catalysis, electrochemistry, and geochemistry. The Science and technology of generating substances from inorganic, non-metallic materials in the presence of heat or by the help of high purity chemical solutions is termed as Ceramic Engineering. It comprises of the study of structure, composition, and properties of raw materials. Ceramics are crystalline materials with partly crystalline structure in the long-range order on the atomic scale. The glass-ceramics is in the short-range atomic scale with an amorphous structure. Ceramics has a unique advantage where it is can be replaced because of its heat resistant capacity. These materials are produced by sol-gel synthesis or by hydrothermal method. Ceramic materials rise the applications in materials science, chemical, electrical and mechanical engineering. It has an exceptional usage in mining, medicine, chemical industry, aerospace, electronics, optical and automotive industries. USA: American Ceramic Society| American Physical Society | Magnetic Materials Producers Association| Materials Research Society| Society for Biomaterials| The Materials Information Society| American Chemical Society. Asia: Technical Association of Refractories, Japan (TARJ) | Chinese Ceramic Society (CCS)| Ceramic Society of Japan | Indian Ceramic Society. Polymer technology is one of the most prevalent zones of existing research as it includes the study and applications of nanoscience to polymer-nanoparticle matrices, where nanoparticles are those with at least in the dimension of less than 100 nm. Polymer nanotechnology emphases on polymer-based biomaterials, self-assembled polymeric films, nanofabrication of polymers, polymer blends and nanocomposites. Polymer matrix based nanocomposites consist of polymer or copolymer having nanoparticles dispersed in the matrix. Silicon Nanospheres is the extensively known Nano polymer which shows discrete features and harder than silicon. Preceding the age of nanotechnology phase, polymer blends, block copolymer domain frequently attains Nanoscale sizes. Nano-sized silica particles, zeolites, and nanoparticle fillers have controlled the expansion of products with enhanced properties such as thermal stability & conductivity, chemical resistance, and tensile strength. Some of the natural and synthetic polymers are collagen, enzymes, elastin, cellulose, chitin, plastics, fibers and adhesives. Europe: The Polymer Society UK| Telford Polymer Association| European Polymer Dispersion and Latex Association| Polish Chemical Society| British Plastic Association. Asia: Asian Polymer Association| Society for Polymer Science, Asia| Polymer Society of Thailand| Federation of Polymer Societies| Polymer society of Japan. Graphene is the crystalline form of carbon that has two dimensional (2D) properties where it consists of single layer of carbon atom arranged in hexagonal lattice. This allotrope of carbon is the basic structure of other allotropes such as diamond, carbon nanotubes, graphite, fullerenes. Graphite which is one of the allotropes of carbon is the softest material with is a very good lubricant and is the conductor of electricity. Because of its known unique property, it is being used as thermal insulation. Natural graphite is of three types of crystalline, amorphous and vein. Carbon has numerous essential applications in the living system. Carbon fibers which are composed mostly of carbon events, in the range of 5-10 micrometers have its application in composite materials, textiles, microelectrodes, Flexible heating. Materials which can be magnetized and attracted to a magnet are termed as ferromagnetic materials. These kinds of ferromagnetic materials comprise of iron, nickel, cobalt, some alloys of rare earth metals, and some naturally occurring minerals such as lodestone. Magnetic Smart Materials also have medical applications and it is predictable that they will increase in the future. Examples are carrying medications to exact locations within the body and the use as a contrasting agent for MRI scans, evaluating the risk of organ damage in hereditary hemochromatosis, defining the dose of iron chelator drugs mandatory for patients with thalassemia, and Nowadays Scientists are also occupied on the advancement of synthetic magnetic particles which can be inoculated into the human body for the diagnosis and treatment of disease. The utilization of Materials science and engineering implies a novel group of materials with its individual logic of effect that cannot be defined just in terms of the normal classes of heavy and light or form, construction, and surface. Materials are the core for scientific and industrial advancements in our life and advancement in the field of electronic materials, biomaterials, sensors, energy materials, light alloys are vital for the information technology, improvement of health, smart atmosphere, renewable energy, improved transportation and other deliberate applications. Coelux lightening system where the scientists used a thin coating of nanoparticles to exactly simulate sunlight through Earth’s atmosphere and the effect known as Rayleigh scattering. Soft materials are the additional evolving class of materials that includes gels, colloids, liquids, foams, and coatings. Characterization is the crucial process in the field of Materials Science, by means of which the materials features, and properties are explored and restrained. Few basic characterization techniques that have been used for centuries include microscopy, spectroscopy and macroscopic testing. Evolving technologies are categorized by vital innovation, moderately fast progression, consistency, prominent impact, and ambiguity. The characterization of materials can limit them to techniques such as microscopic structure and properties of materials, while others use the term to mention to any materials analysis process including macroscopic techniques such as mechanical testing, thermal analysis, and density calculation. The measure of the structures observed in materials characterization ranges from angstroms, such as in the imaging of individual atoms and chemical bonds, up to centimeters, in the imaging of coarse grain structures in metals. Materials make up the existing world, from the concrete in buildings and bridges to the advanced carbon fibers and ceramics in high-performance cars and even to the nanoparticles in self-cleaning bricks. Materials exploration is varying based on the design, build and new products. The materials in the industrial sector embrace zones of mining, transport, chemical, oil and gas, pharmaceutical, aeronautical, food and medical. The existing and future needs of human can be fulfilled by industries in accomplishing the anticipated resolution on goods. The main materials formed by industries are metals, inorganic nonmetals, and plastics. The 17th International Conference on Emerging Materials and Nanotechnology, hosted by Conference series LLC was successfully held during March 07-March 08, 2019 at Berlin, Germany. The conference highlighted the theme “Unearthing the Researches in Materials Science and Nanotechnology”. The conference was successful in gathering eminent speakers from various reputed organizations and their paramount talks enlightened the gathering. The pragmatic meet organized by CONFERENCE SERIES LLC received a generous response from the Editorial Board Members of CONFERENCE SERIES LLC Journals as well as expertise from academia, talented researchers and young student community. Researchers and students who attended from different parts of the world made the conference one of the most successful and productive events in 2019 from CONFERENCE SERIES LLC. The conference was marked with the presence of renowned Speakers, Young Researchers, Students and Business Delegates driving the two-day event into the path of success with thought-provoking keynote and plenary presentations. All the above-mentioned Honorable Guests and Keynote speakers gave their energetic and fruitful contributions and special thanks to our Honorable Moderator P Jabłoński, AGH University of Science and Technology, Poland for his remarkable contribution towards smooth functioning at Emerging Materials Congress 2019. CONFERENCE SERIES LLC would like to convey a warm gratitude to all Honorable Guests and Keynote Speakers of Emerging Materials Congress 2019. Emerging Materials Congress 2019 witnessed an amalgamation of peerless speakers who enlightened the crowd with their knowledge and confabulated on various newfangled topics related to the field of Biosensing Technologies. CONFERENCE SERIES LLC top notch conference covered the au courant strategies dealing with related fields of Materials Science technologies which can pave way to bring revolution in the field of Materials Science and Nanotechnology. We are obliged to various delegate experts, institutes and other eminent personalities who actively took part in the discussion and meetings. We sincerely thank the Organizing Committee Members for their gracious continuous support towards the success of Emerging Materials Congress 2019. 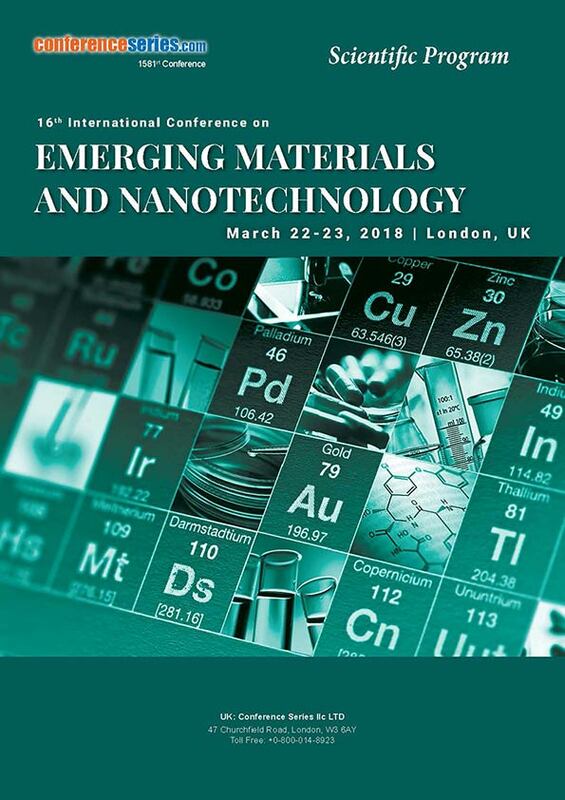 With the valuable feedback and generous response received from the participants of the event, CONFERENCE SERIES LLC would like to announce the commencement of the “18th International Conference on Emerging Materials and Nanotechnology” during February 26-27, 2020 at London, UK.